Clarets boss Sean Dyche admits there is an element of susprise at his side’s superb start to the season. His players have climbed to seventh place in the Premier League table – level on points with Liverpool and Arsenal – after 11 games, after taking 19 points from their best opening to a top-flight campaign since 1972/73. Burnley have claimed 11 of those away from home so far, having taken only seven points all last season away from Turf Moor. Only unbeaten leaders Manchester City have lost fewer games than the Clarets so far. And, asked if he was surprised, Dyche said: “Of course, there’s no point in throwing words like honesty in and not being honest about it. “Nobody would have thought we’d have these points on the board at this stage of the season. “It’s not that our performances weren’t getting better, last year away from home they were getting better, the margins were getting so tight. “At the minute we’re the right side of the margins, that’s an important factor, it’s a skill in itself. “Now it’s so far. We’ve got to keep doing that and moving forward. Yes, I’m very pleased. Did I think we’d have this many points? No. “Did I think we’d have good points and be in reasonable shape? Yes I did. 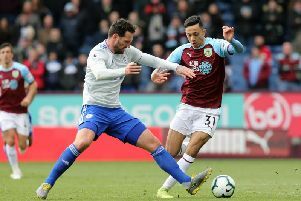 Burnley only claimed their first away win at the penultimate attempt last term, at Crystal Palace in April, but already have three wins on the board, at Chelsea, Everton and Southampton. Their only away defeat has come at runaway leaders Manchester City. So what has changed? Dyche mused: “The players had a tough but a good Premier League campaign last year, and that adds another layer to their experience. “It’s the assuredness from operating at that level. “In all of our lives, whatever level you go to, at first you’re fighting it and hoping it’s all right and you’re doing the right job. “And then you start to go ‘hang on a minute, I’m in control of this’. We’re learning how to control it better. Then you’ve got adjustments with the players, recruitment, the work on the training pitch, their own professional outlook. The squad mentality is vital I think for clubs like us, because we’re not the real deal and we haven’t got a team full of technicians – we need a group that can work and fight when they need to. “I can’t tell you there’s one secret moment when we thought ‘right, that’s how we change our away form’. It’s a lot of things.